The World Awaits Nathan's 2008 Hot Dog Contest: 'Jaws' vs. 'The Tsunami' vs. . . . Bertoletti? 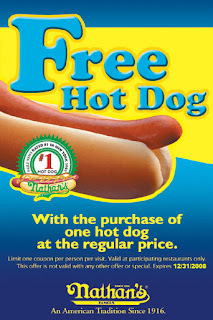 We are just days away from the 2008 Nathan's Famous Fourth of July International Hot Dog Eating Contest, and the excitement is building. Approximately 20 eaters will be vying for the most famous food title in America. Last year, an estimated 50,000 came to Coney Island to watch Joey "Jaws" Chestnut shovel down 66 Nathan's hot dogs to take the coveted Mustard Yellow Belt from reigning champion Takeru "Tsunami" Kobayashi. Chestnut appears to be in fine shape. On March2, he put away 78 matzoh balls during Kenny & Ziggy's World Matzoh Ball Eating Championship in Houston, TX. But don't rule out the Tsunami -- he still possesses the soul of a champion! But wait -- the Major League Eating website shows that Chestnut is currently ranked first in the world of eating -- and Kobayashi is only third! The time change may favor quick eating Patrick Bertoletti. According to MLE, "The steadily improving Bertoletti had his breakout season in ’06, when he set an astonishing eleven records." *UPDATE: Odds-makers have updated their figures to put Joey Chestnut in the lead. 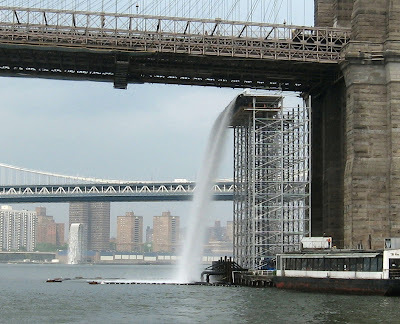 Here's an idea for a thematic bike ride: A route taking you around Olafur Eliasson's Waterfalls has been created by the Department of Transportation, in collaboration with the Public Art Fund. 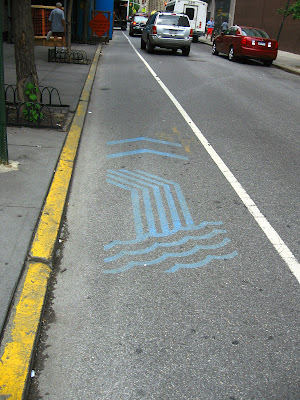 It's marked by these linear blue waterfall icons on streets and bike paths. The icon shown above was found on Clinton Street in Brooklyn Heights. Late last night, Gov. David Paterson made his presence felt in the negotiations between Con Ed and its union representing 9,000 workers -- most of its labor force -- minutes before the midnight strike deadline, and persuaded both sides to agree to a "cooling off period," according to wcbstv.com. Negotiations are scheduled to resume at 9 a.m. Tuesday. Con Ed is offering its workers a raise of half a percent, followed by 1 percent in the years after that, according to the Daily News. The NY Times reports that the last Con Ed strike occurred in 1983, when 16,500 workers went on strike for nine weeks. 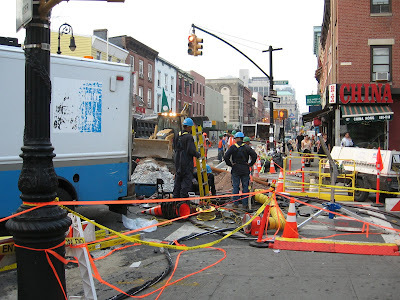 Con Ed said that the strike had little effect on most consumers, but union officials said it delayed repairs of an electrical substation knocked out by a fire and caused a three-day blackout in the garment district. These families and a small stream of tourists, filmmakers and newspaper photographers enjoyed Brooklyn's new pop-up park on opening day yesterday, at the site of the defunct Pier 1 on the waterfront at Fulton Ferry Landing. It's a pretty little swath of white cement, grass and sand. We recommend coming early or late -- the only shade is the Rice concession awning, and by 2 p.m. it was pretty darn hot out there. . .
Hi all. We got back to Brooklyn just in time to see the waterfalls. We want to believe, but we are conflicted. On the one hand, from land, they appear more like leaky scaffolding than waterfalls (as in top photo, shot from Empire State Park, north of the Brooklyn Bridge). It looks like DOT is getting ready to sandblast the bridge. Which is probably a good idea, considering the condition of the bridge. On the other hand, you get a different perspective from the south side, where you can see two of the waterfalls at once (photo below). It hit us that there could be a whiff of majesty to the things. You just have to sort of squint. 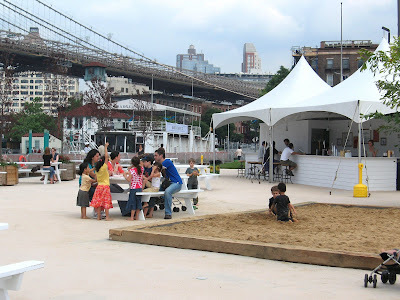 McBrooklyn Photo of the Day: Remember When We 'Swooned' in Brooklyn Bridge Park? While McBrooklyn is out of town for a week or two, we decided this would be a good time to publish some of our favorite photos. Some have been published before, but others never made it to the blogosphere. This one gets points for the weirdness factor. "Swoon," a theater/dance/performance piece by Australia's Strange Fruit performed last summer in Brooklyn Bridge Park. In the 20 minute performance, the four-member cast swayed eerily on poles above the crowd. 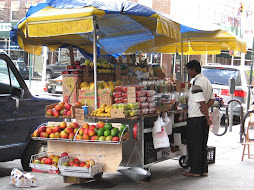 Today's "photo" is a video of Joseph Ades: possibly the most successful street vendor ever in the history of New York City. Born in England but with a voice that recalls Australia, Joseph Ades is a living legend. Many have sought Mr. Ades but could not find him. So McBrooklyn shot a video of this amazing salesman at work. UPDATE: Gawker had just named Mr. Ades as NYC's top eccentric. See here. 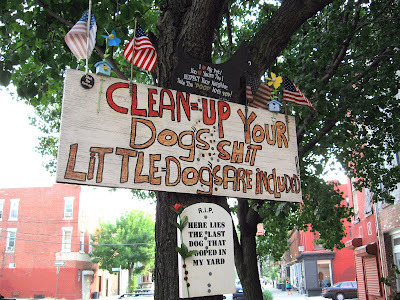 This wonderful sign is on a tree in Red Hook, Brooklyn. Some of the messages on it can be found here. Today's photo of the day is actually two: the scene of the crime, and the "I Eat 'Em Raw' guy apprehended. 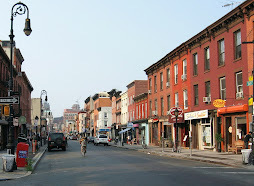 Last June, a suit-type dad (above, wearing gray, crumpled onto the sidewalk) was blithely walking his two pre-K kids to school on Joralemon Street in Brooklyn Heights when a buff youngish guy swooped out of nowhere and coldcocked him -- not once, but twice. After an almost instantaneous response by the 84th the alleged perp (wearing a blue T-shirt stating "I Eat 'Em Raw") was apprehended on Court Street, cuffed and spirited away in a police car. No one seemed to know why he did it, including the injured dad, who was taken to Long Island College Hospital with facial injuries and breathing problems. This photo of a window display at the Perfect Paws pet store in Brooklyn Heights created a bit of an online sensation last June. Today's photo shows the day last year when ten tons of deep, rich loam, spilled onto Cadman Plaza West behind 75 Henry Street in Brooklyn Heights, where quite a gardening job was suddenly interrupted. While McBrooklyn is out of town for a week or two, we decided this would be a good time to publish some of our favorite photos. Some have been published before, but some never made it to the blogosphere. We've always loved the kid in this photo. 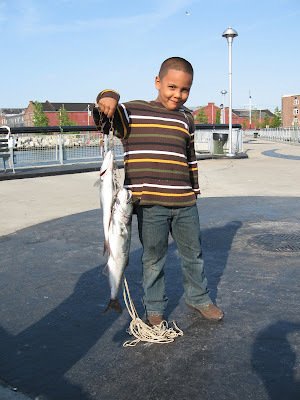 He caught those beauties right off the Louis J. Valentino, Jr. Pier at the end of Coffey Street in Red Hook. The bluefish were really running that day. 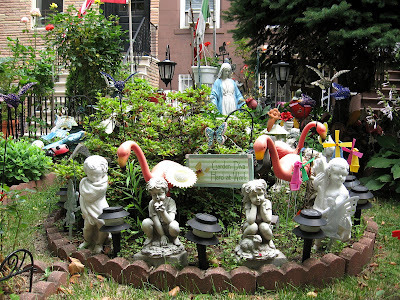 Today's photo is a picture of a physical monument to the human spirit, owned by a guy named Ralph. 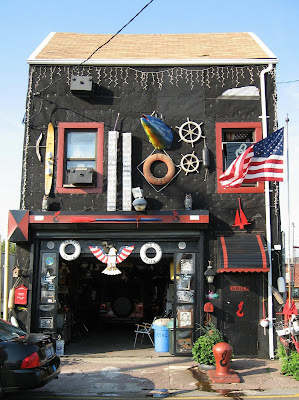 Covered in nautical memorabilia and filled with the precious debris of ages, this place has long been where Ralph and his friends hang out, shoot pool and sit in the shade. What's inside Ralph's place is even more amazing than what's outside. 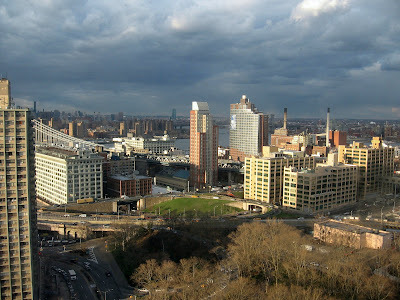 This photo of Dumbo was taken on April of 2007, prior to the Landmarks Preservation Commission's decision to grant Dumbo landmark status. Those spectacular fireworks Saturday night were in celebration of Children's Day at South Street Seaport. The barges were in the river between the Seaport and Brooklyn Heights and it seemed to us that it was the longest fireworks display in some time. During the afternoon, kids sang along with Gordon from Sesame Street and enjoyed free entertainment. There were also educational activities at the Seaport Museum, and pirate sails aboard the schooner Pioneer. 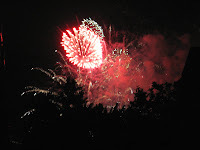 In spite of the rain, it all ended well with the "Spectacular Target Fireworks" accompanied by the Brooklyn Philharmonic. At least a dozen shoppers thought they were getting a real steal: discount iPhones through a Craigslist posting. But when they showed up in Flatbush to pick up their phones, they were violently robbed at gunpoint. And that's before the service fees kicked in. Live in Brooklyn? Run for Office! Holla Back, the blog where people post photos of creeps who harass them on the street, lets us know about the movement to bring folks into the political fold through a little known office called County Committee. According to Holla Back, there are 5000 of these seats across Brooklyn, and half of them are empty. To run, all you have to do is be a registered, voting Democrat living in Brooklyn over the age of 18 -- and you have to get about 20 -25 signatures from your neighbors. More details at New Kings Democrats , an organization which hopes to help produce the next generation of Brooklyn political leaders. 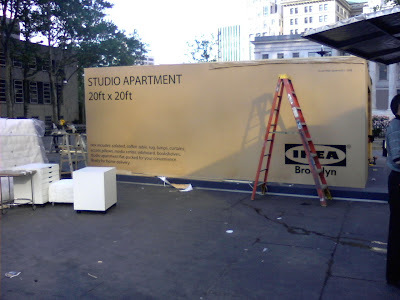 "Ikea has created a decorated shed so iconic it's become a duck: An Ikea-looking building can be nothing but an Ikea. To use another term from 'Learning from Las Vegas,' it's a decorated shed that quacks." A 62-year-old math enrichment teacher was attacked outside a Catholic school in Marine Park, Brooklyn. A security camera captured it on video. 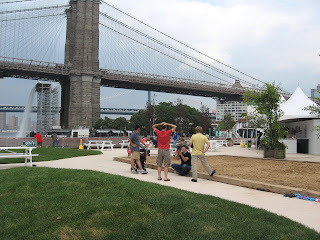 The Brooklyn Eagle reports: A pop-up park of more than half an acre, is being created for the summer by the Brooklyn Bridge Park Development Corporation. Marianna Koval, president of the Brooklyn Bridge Park Conservancy, surprised the crowd with the news at the Community Board 2 meeting last night. The new park will have waterfall views, a sand beach and a food concession. This year's Gay Pride parade is taking place Saturday, June 14 from 8 - 10 p.m. This year's theme is "Live Love Be." Events include an interfaith service on the 11th, a reception at Borough Hall, 10K run, an all-day multicultural festival, and an after-pride party. Whatever Happened to Las Tres Palmas? 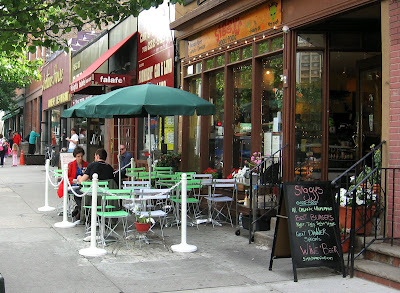 Las Tres Palmas, an old-style Latin restaurant, used to be on Court Street in Brooklyn Heights. Then it moved to 121 Livingston Street off of Boerum Place in Downtown Brooklyn. LTP was one of the better places to get dishes like chicken chiccharones, but we sort of forgot about it after it moved. Been a long time, so we walked to Livingston the other day and -- OMG -- they're gone. 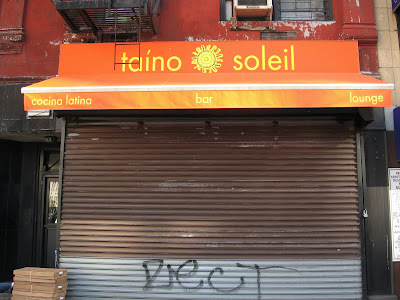 Now Taino Soleil is in the spot. We heard it officially opened with a "blowout celebration" last Friday night. Anybody try it yet? 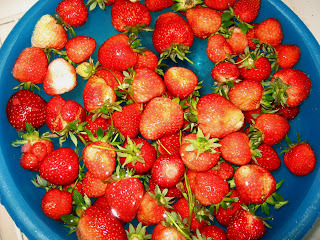 The strawberries have been coming in like crazy! Squirrels have been nibbling on them -- they take one bite out of each berry. Luckily, there are a lot of berries, so there's still enough to make cobbler. 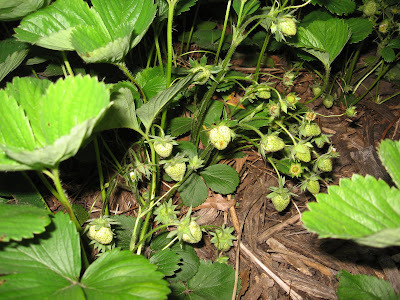 The photo below shows what they looked like on May 27. A Brooklyn grand jury has indicted a builder for manslaughter. The builder, William Lattarulo, dismissed his contractor to save money, even though he had no experience contracting himself. Though his workers warned him repeatedly about problems such as a faulty foundation and possible underpinning of the building next door, he kept repeating, "Don't worry about it." One of his workers was buried alive while digging the foundation when the house next door collapsed into it. His lawyer says the case should be dismissed: "Construction accidents happen in New York City as a matter of routine." Power outages are still scattered throughout Brooklyn and parts of Queens. Here's the Wednesday morning data from Con Edison. 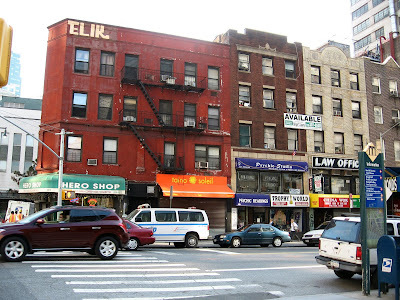 South Brooklyn is experiencing multiple problems, but very few buildings are actually affected. Gowanus Lounge shows the situation at 8:15 this morning, when things looked much quieter. 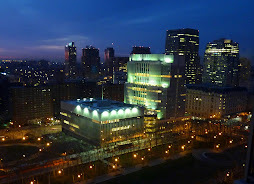 - More about the possible loss of Long Island College Hospital on the Pardon Me For Asking blog. - Streetsblog will be offline Wednesday as they transition to a new design. This is the 1 a.m. update: Multiple power outages are spreading across Brooklyn and Queens, according to Con Edison. The above map, current as of 1 a.m. Wednesday, shows power failures especially afflicting South Brooklyn, along with Boerum Hill, Bushwick and parts of Queens. Earlier, Con Ed said that the affected neighborhoods cover an area bounded by Avenue H on the north, Shore Parkway and Gravesend Neck Road on the south, 19th and 20th Avenues on the west, and East 15th and 16th Streets on the east. Included are parts of Bensonhurst and the neighborhoods of Midwood, Gravesend, Ocean Parkway and Sheepshead Bay. Crews are working now to repair the problems in these areas. Con Edison has asked customers in the affected areas to refrain from using washers and dryers, dishwashers, and to turn off any non-essential appliances to help reduce electricity usage until equipment problems can be resolved. 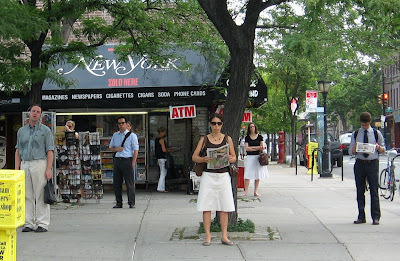 And here's the photo -- taken on Montague Street about 3 p.m. -- to prove it. Is your doctor affiliated with Long Island College Hospital (LICH) in Cobble Hill, Brooklyn? Many of the hospital’s doctors and their political allies leveled serious accusations at a rally outside the hospital Monday, according to the Brooklyn Eagle. They accused the hospital’s parent body, Continuum Health Partners, of financial mismanagement and leaving the hospital in a precarious position. Some are worried that the hospital, sucked dry, will fold like five other clinics closed by Continuum. The complaint alleges inadequate financial records, and points to growing losses by LICH -- $15.89 million in 2006, $21.7 milion in 2007, and a projected loss of as much as $35 million in 2008. What happened to the fabulous $140 million bequest to LICH by the late Dr. Donald Othmer in 1995? 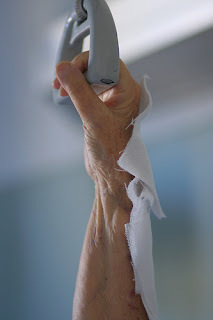 Down the tubes, according to the doctors. 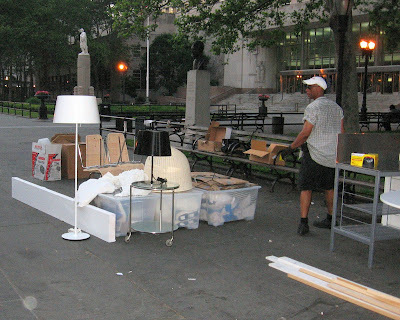 Last night Ikea workers were busy disassembling the full-size Ikea "studio apartment," set up to look like it's inside a cardboard box, outside Brooklyn Borough Hall plaza. Lucien first brought this to our attention yesterday. Anthony Affrondi, proprietor of Los Paisanos Meat market at 162 Smith Street took no chances, according to the Brooklyn Eagle. 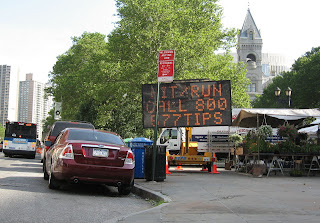 He loaded his frozen meat and fish onto a refrigerated truck during the Great Boerum Hill blackout of '08. The blackout is almost, but not quite, over. Los Paisanos and a few other homes, businesses and restaurants are still without power. Should we order the fish tonight? Just in case we didn't remember that Ikea is opening in Red Hook on June 18, they sent us a little present! 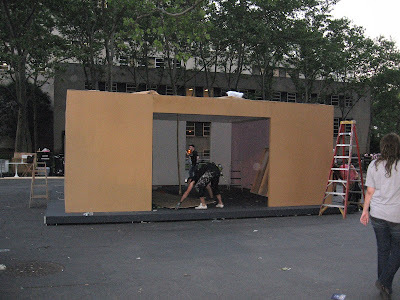 "Saw workmen setting this up on my way into the office today; looks like it's going to be a full-size Ikea 'studio apartment', set up to look like it's inside a cardboard box, outside Brooklyn Borough Hall/Cadman plaza. Thought you might be curious --"
Thanks, Lucien. We can't wait to see how this will look when it's all set up. The box includes a 20ft x 20ft studio apartment, complete with sofa bed, coffee table, rugs, lamps, curtains, pillows, media center, sideboard, bookshelves. 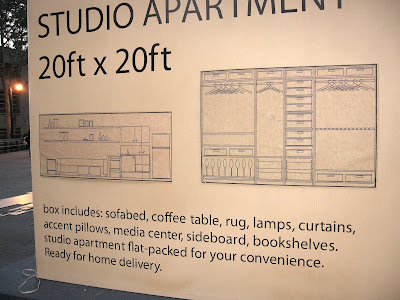 The shipping container says "Studio apartment flat-packed for your convenience. Ready for home delivery." Hope there's an air conditioner! 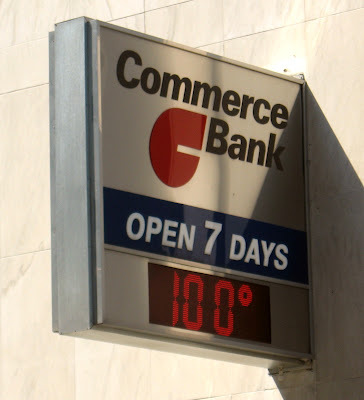 As Boerum Hill and Williamsburg cope with power outages, the National Weather Service said the temperature could reach 100 in the city on Monday -- and it could feel like 105 because of the humidity. An Excessive Heat Warning is in effect from noon to 7 p.m. If you don't have power/air conditioning, call 311 to find the nearest cooling center, drink plenty of liquids, and check up on relatives and neighbors. 1,500 Boerum Hill residents without power Sunday night/ Monday morning. UPDATE: Con Ed reports 2,200 without power in Brooklyn as of 6 a.m. Monday morning. Hundreds gathered in Cadman Plaza Park in Brooklyn Heights/Downtown Brooklyn Saturday evening for an overnight 20-mile walk to raise funds for suicide prevention. The event is called the Out of the Darkness Overnight, organized by the American Foundation for Suicide Prevention. Many of the walkers have lost friends and family members to suicide. 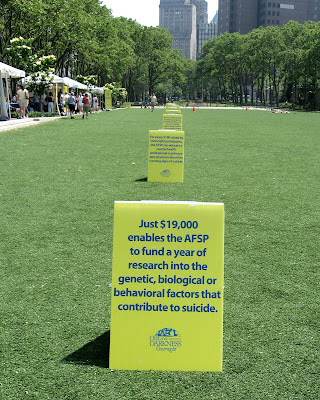 The money raised will go to understanding and preventing suicide through research and education. 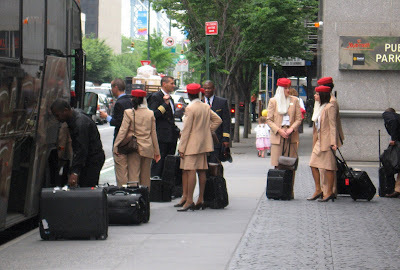 Every day a group of exotic looking stewardesses embark from the Marriott in Brooklyn. According to Uniform Freak, these ladies work for United Arab Emirates airlines. A manhole fire in Boerum Hill, Brooklyn has shut down several subway lines and is causing major delays on others, Fox News is reporting. The fire was discovered around 5:45 p.m. Affected trains include the G, the 4, the F, and the 2 and 3. UPDATE: Power was reported out in several blocks of Boerum Hill as well. No word on when or if it has been repaired. 1. Youth basketball groups who came because Bruce Ratner sponsors their tournaments. 2. Area workers who came for the free sandwiches. 3. Kids, off from school Thursday, who came for the free key chains and autographs of former Nets. 4. Unions who came because Ratner has promised to hire organized labor. 5. 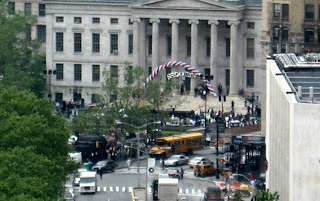 Seniors from senior centers, who were told it was a party for Brooklyn Day. Headliner Rev. Al Sharpton couldn't make it. He was “stuck in Detroit," according to the Observer. From the Daily News and the Brooklyn Eagle. 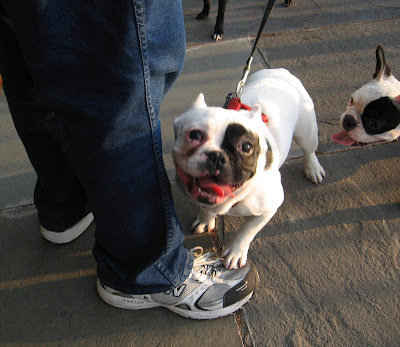 Two little black-eyed French bulldogs met for the first time yesterday on the Brooklyn Heights Promenade. They are unrelated. The Department of Transportation is preparing for a major change in traffic patterns at the intersection of Adams and Tillary Streets, at the entrance to the Brooklyn Bridge, starting Saturday. This intersection (marked with an orange arrow, above) has been the scene of many devastating accidents. DOT is trying to make the intersection safer by prohibiting left turns onto the Brooklyn Bridge from Tillary Street (heading eastward), and by also prohibiting left turns onto Tillary Street from Adams Street (heading north). The green lines above show that cars will have to take Jay Street or Cadman Plaza West if they need to get to the Brooklyn Bridge from Brooklyn Heights. They're giving pedestrians a bit more time to cross, as well. The Brooklyn Eagle goes into this in detail. Many people concerned with this issue “are in a complete uproar,” said Judy Stanton, executive director of the Brooklyn Heights Association. Some are predicting big traffic jams at Joralemon and Court Street. However, Stanton and others give the DOT brownie points for at least trying to solve the problem. It's a six-month trial, which can be adjusted as needed, says DOT. 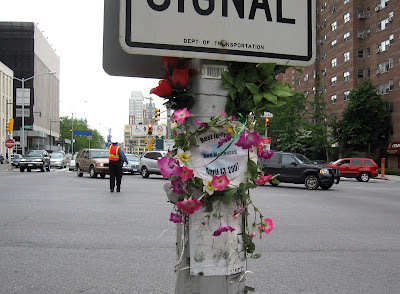 The bottom photo shows a lamppost memorial to Ron Mortensen, killed trying to cross the street at the intersection of Adams and Tillary last year. The photo was taken yesterday by MK Metz. 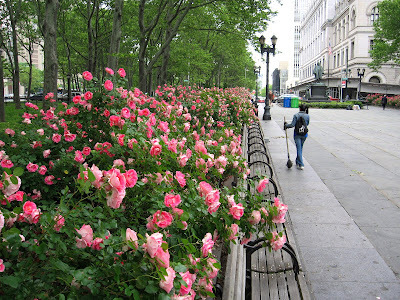 A wild profusion of roses lines the walkway in Columbus Park, at Borough Hall in Downtown Brooklyn. To the right is a statue of Henry Ward Beecher; behind that is the Post Office. Looks like it might be a pleasant place to eat breakfast on a nice day. 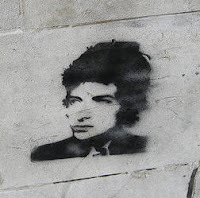 Pre-sale tickets for the August 12 Bob Dylan concert in Prospect Park, Brooklyn, are sold out. What are the scalpers getting? The cheapest pre-sale lawn tickets ($55 plus about $15 work of fees) are now going for $140 - 200 on TicketTriangle. The chairs near the front ($85 - 100 plus fees) are going for $300 - 600. The most desirable seats are going for up to $1000 on StubHub. That's just greedy! Craig's list had some yesterday, too. Only the Blog Knows Brooklyn might even give some away -- if Teen Spirit doesn't want them. Have to hand it to the Brooklyn Paper for breaking news of the Dylan concert story first. Brooklyn Vegan commenters broke the secret code early on so quite a few locals snagged the hot pre-sale tickets at TicketMaster. We've read that more tickets will be coming up at a future date, so keep checking if you're interested. 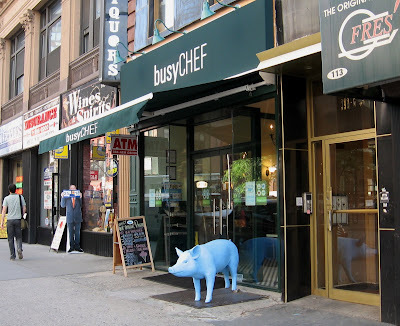 Blue pigs are proliferating in Brooklyn. This one's in front of the new Busy Chef on Court Street. It's a close sibling to the blue pig on Henry Street in the North Heights, in front of Blue Pig ice cream shop. 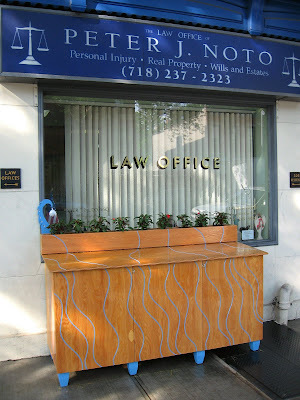 And The Garbage Bin Award Goes To . . .
. . . the law offices of Peter J. Noto, 326 Atlantic Avenue, Boerum Hill, Brooklyn. 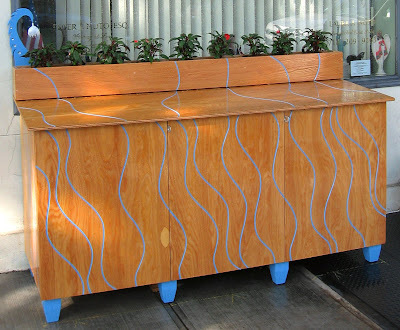 The wooden cabinet features clean, simple lines, set off with undulating blue inlay, a little blue tassle/tail at the upper left and starkly contrasting legs. 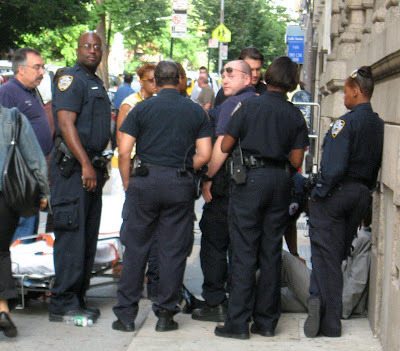 A silver sedan plowed into an 88-year-old man at the intersection of Montague Street and Court Street5/Cadman Plaza West in Brooklyn Heights at about 3:40 Monday afternoon and kept going -- even while the man was on the hood of the car. A witness told police the car swerved to get the man off the hood, according to 1010 WINS and the Daily News. Then the car sped off, leaving the victim in critical condition. Reports say he was taken to Belleview. Police are asking any witnesses to call 800-577-TIPS. 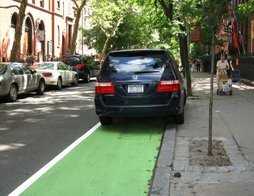 Adams Street Bike Lane -- Is This Someone's Idea of a Joke? 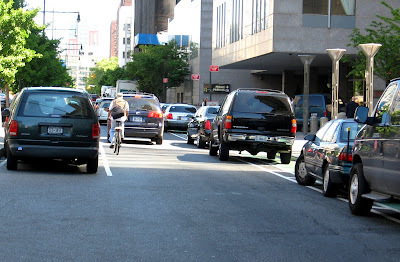 Bikers take their life into their hands on the Adams Street service road, in front of the Marriott in Downtown Brooklyn. The cars were right on this guy's back after this picture was taken. Lots of cars and lots of bikers streamed through the lane as we stood there, about 8 a.m.
That funny green stripe under the parked cars to the right is the bike lane. There are comments in Brownstoner about this lane. Also on My Bike Lane. We recently read about President Jimmy Carter's little run in with an evil bunny. Now we've seen a wabbit that matches the general description of the President's attacker -- and it's in a window at 287 Smith Street. 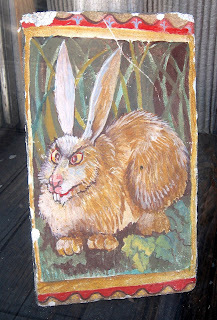 This is obviously a killer swamp rabbit. No joke. 100 Clark Street 'Creaking' and Rocking?